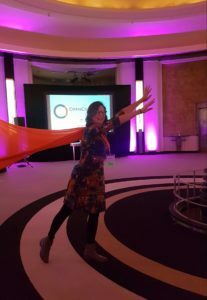 The annual OpenCon conference brings together the most promising students and academic professionals in early career that drive open access, open data, open educational resources, and many other aspects of scientific culture and open education. 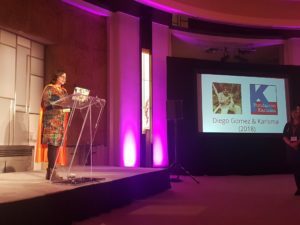 On November 2, the OpenCon community presented the Next Generation Leadership Award during the conference that took place in the city of Toronto, Canada. We are very happy to tell you that this year we received the award along with Diego Gómez, for having led the “Sharing Is Not a Crime” campaign. These were the words that María Juliana Soto, coordinator of the campaign and who received the award on behalf of Karisma and Diego. On such crucial days for the future of public education in Colombia, we share this award with Colombian students. Our commitment to the promotion and access to knowledge is our way of telling them that we are with them. As alumni of Open Con, Diego Gomez and I feel honored to be recognized with the Next Generation Leadership Award, and is an honor for me to be here on behalf of Diego and Karisma Foundation. First of all, we will like to start by saying that this prize thrills us because it is a community of students and early careers that gave us this great recognition. It was the students from all over the world to whom we directed our campaign. We knew that we could count on your strength, your energy and your sense of justice to support Diego through the legal process that required a lot of collaboration and affection. The latam community of Open Con knows very well what I’m talking about. 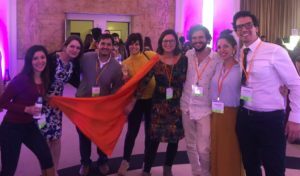 “By winning this award we represent a group of people that work every day for the democratization of access to knowledge but also for its production. From social leaders in the Latin American countries -indigenous groups, afro descendants, mestizos- to people with high academic degrees who refuse to abandon our territory, we share the goal to achieve social and environmental well-being in our region, as well as sovereignty over our usurped knowledge by colonialism structures from centuries ago and from other modern ways of colonialism we face nowadays. From my side, I want to express that “Sharing is not a crime” campaign was a creative challenge, a constant lesson, an opportunity to understand the ecosystem of knowledge and its profound inequality and contradictions. The campaign helped us realize all the work that we need to do, especially from regions like ours, where law reforms, including copyright reform were, in many senses are a copy and paste from foreign norms, and where there is a lack of empathy and knowledge about the needs of the most vulnerables groups of people. In other words, this campaign was for me a personal commitment. We should also acknowledge the lawyers that supported the case especially Juan Diego Castañeda, German Realpe and Claudio Zambrano, and the forensic engineer Daniel Torres whose findings were key to explain how sharing is natural to academy. I personally want to say thanks to Karisma Foundation and Diego, for the trust they deposited in me to led this campaign. This award is shared with Carolina Botero and Pilar Saenz and with all the people that was part of our communications team during these former years: Nathaly Espitia, Laura Rojas, Camila Barajas, Miguel Tejada, Julian García and Mauricio Gatiyo. So, Karisma, Diego and I decided that this award belongs to all Colombian students that are now in the streets advocating for the right to education and to protest against the lack of budget for public universities in our country. ¡Viva la U!